UPDATED: Fri., Aug. 10, 2018, 4:55 p.m.
SEATTLE – After all, you’ve waited all spring and summer for a real, live, NFL game, and its arrival is an event – right up to the kickoff. But once that threshold is passed, with the requisite rush of adrenalin, you are left with the tedium, raggedness and obscurity that is exhibition football, as monotony quickly sets in. This year, not so much. Not for a Seahawks team with more uncertainty, more questions and more genuine competition for jobs than they’ve had at any time since the fledgling days of the Pete Carroll era. Never thought I’d say it, but these preseason games for Seattle, circa 2018, have the potential to be – what’s the word, tip of my tongue. … meaningful. Oh, they will still be tedious and ragged at times, greeted with the customary torrent of over-reaction and rampant conclusion-jumping. But these Seahawks are a genuine mystery, seemingly as capable of going 6-10 as 10-6. And on Thursday, in a ragged and tedious 19-17 loss against the Indianapolis Colts, we began plumbing for clues. The answers that emerge, in fits and starts, will perhaps give a hint of whether the Seahawks will thrive or wilt once they play for real. So we peered intently, watching to see how the Seahawks’ perpetually maligned offensive line looked in its initial unveiling. Quite good, in fact, opening holes and providing suitable protection on Seattle’s 12-play, 75-yard drive for a touchdown on its first possession (the only one with Russell Wilson at the helm, and the highlight of a night of lackluster offense). Naturally, there was a false start; improbably, it wasn’t Germain Ifedi but rather D.J. Fluker. Would the running game, so ineffectual last year, and so emphasized by Carroll this year, show signs of promise? Why, yes, in fact, they did, at least early, with Chris Carson rattling off two nice runs, of 12 and 8 yards, on that drive. He spun and cut with aplomb, in addition to bulling for 3 yards on fourth-and-1 to keep the drive alive. Rashaad Penny, while generally quiet, also had a tantalizing run, turning the corner after being seemingly bottled up, gaining 5 yards. Wilson did Wilson things, scrambling twice for gains totaling 14 yards, and completing four of five passes for 43 yards, including a 5-yard touchdown bullet to Nick Vannett, before getting bubble-wrapped for the rest of the game. Austin Davis, vying for the backup job, led a nifty drive – until throwing it straight to Indy’s Nate Hairston for an end zone interception that won’t sit well with Carroll. On defense, a big story line this year is how the pass rush will develop in light of the departure of Michael Bennett and Cliff Avril. The first name to pop was defensive end Rasheem Green, a third-round pick who had a sack in the first quarter and shared another with Jacob Martin in the third quarter. From the moment he arrived in Seattle, linebacker Shaquem Griffin has been the subject of intense scrutiny. In his NFL debut, Griffin had a sequence of four tackles on four consecutive plays on his first drive, answering immediately the question of whether a one-handed player can tackle at this level. Griffin’s energy and range were evident immediately – and his twin brother had a nice breakup of an Andrew Luck pass intended for T.Y. Hilton during the brief playing time given to the first-team defense. There were other bite-sized nuggets to chew upon, like a sack by outside linebacker Barkevious Mingo against his former team, and a play by Delano Hill on a punt return in which he appeared to rip the ball out for a fumble. 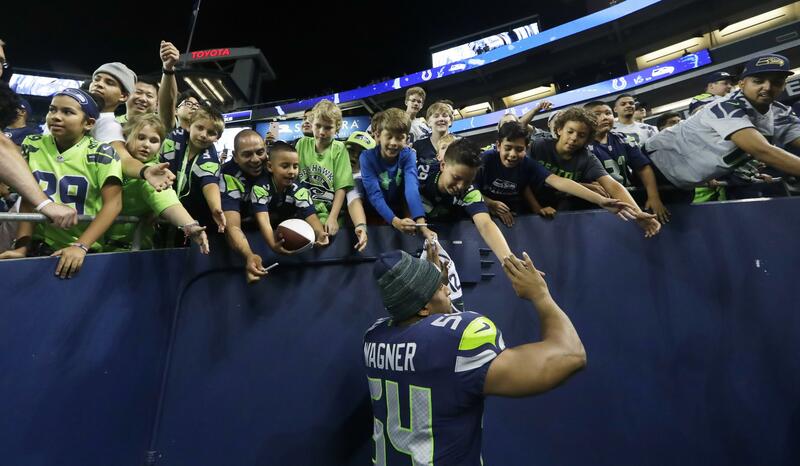 Though the refs ruled that forward progress had already been stopped (despite Bobby Wagner running onto the field to plead for the fumble), the near turnover no doubt caught the eyes of coaches – as did a glaring missed tackle by Hill on a third-down play that ended the game. The kicking battles, both of them, were unrevealing, though Jason Myers was the first kicker to boot a field goal, nailing a 43-yarder, and rookie punter Michael Dickson had a high, spinning punt that the Colts’ returner couldn’t handle cleanly. That was a 61-yarder, nearly matched later by Jon Ryan’s 53-yard punt. We will learn more over time on that front, just as the secondary battles will clarify themselves more definitively. Give an early plaudit to cornerback Justin Coleman, who had a brilliant sequence on Indy’s opening drive, combining with Bradley McDougald on a tackle for loss, then breaking up a pass with a diving play. Published: Aug. 10, 2018, 4:48 p.m. Updated: Aug. 10, 2018, 4:55 p.m.